The baby quilt is totally finished. This is the pattern that was a freebie from the Temecula Quilt Company website last fall. Some of you may have seen variations of this pattern because quite a few quilters made it. I didn't do it when it was first put out but when I was thinking of a baby quilt for the next little one, this pattern came to mind. 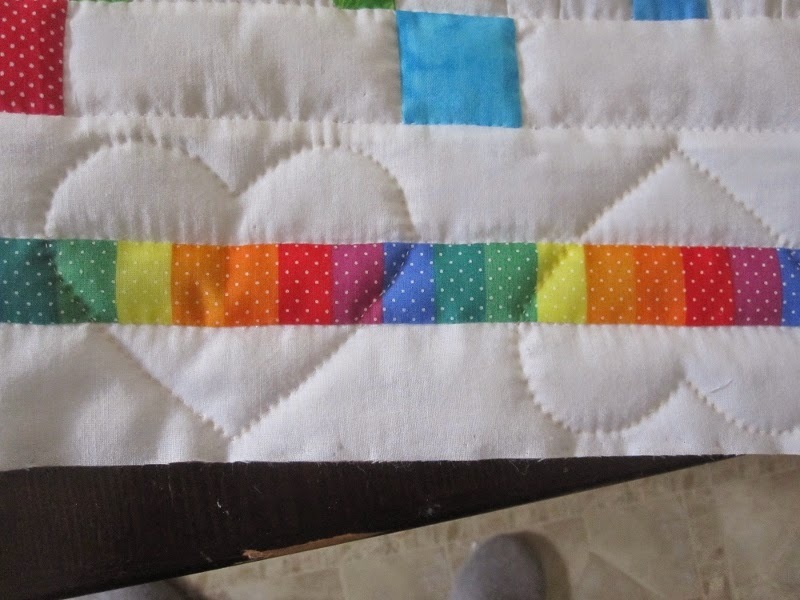 I quilted hearts in the border and the rainbow fabric was given to me by Marg one evening when we were quilting. She had two pieces of it and when I told her I was trying to figure out a border, she offered one of the pieces. I bound it in the darker blue that's in the quilt. 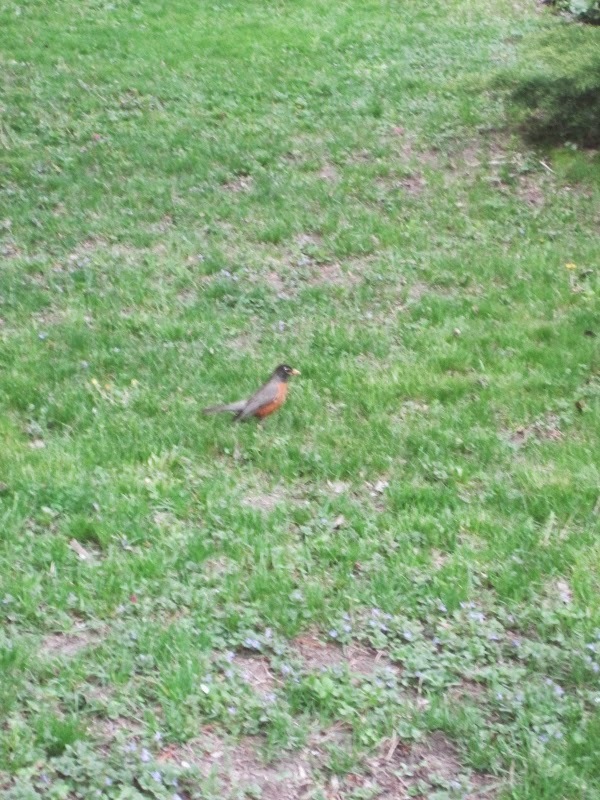 I didn't like the original size. I thought it was too small so I increased the sashing to 1.5 inches finished instead of the one inch that was suggested. My quilt finished at 38" X 43". I didn't like the triangles that were in the original pattern either - for the 'extra' blocks. To me they didn't make sense - they were just triangles placed in different ways. I decided that little animals appliqued in the odd blocks would be a whole lot more fun. I think the bunny is my favourite. I had a lot of fun choosing fabrics for this quilt and absolutely everyone who has seen it has liked it. Most importantly, the future mommy and daddy like it. 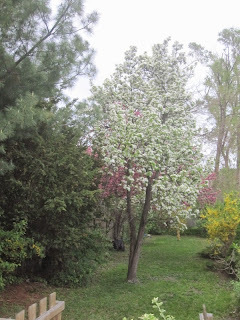 This was what part of my backyard looked like on Mother's Day. Have a great weekend. I still have a few baby things yet to finish and one or two more things I was hoping to make. Well,this baby quilt is now my favorite. I love what you did with it. The animals are perfect for it. I love the changes you made. 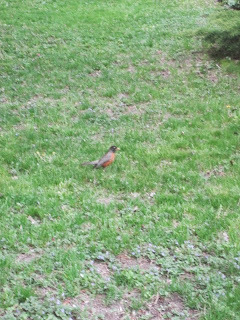 The little animals are so cute. 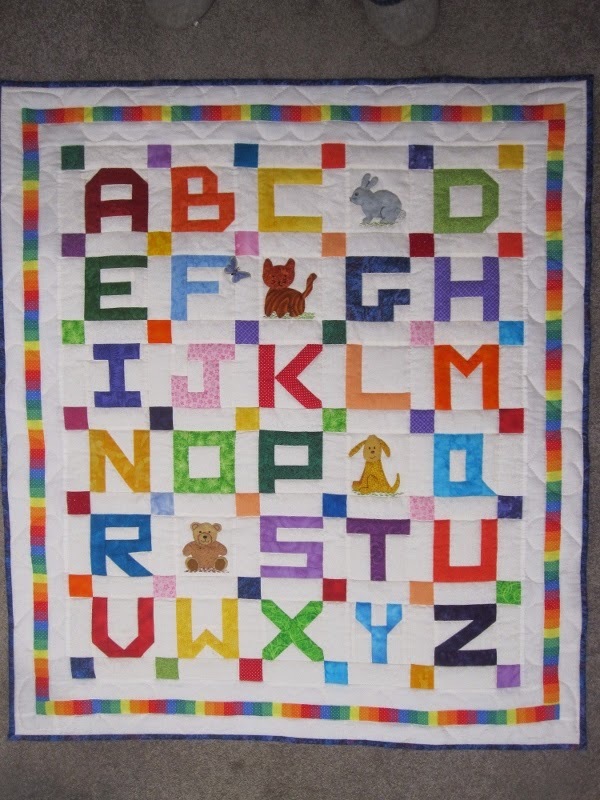 I think this is the best little letters quilt that I have seen. 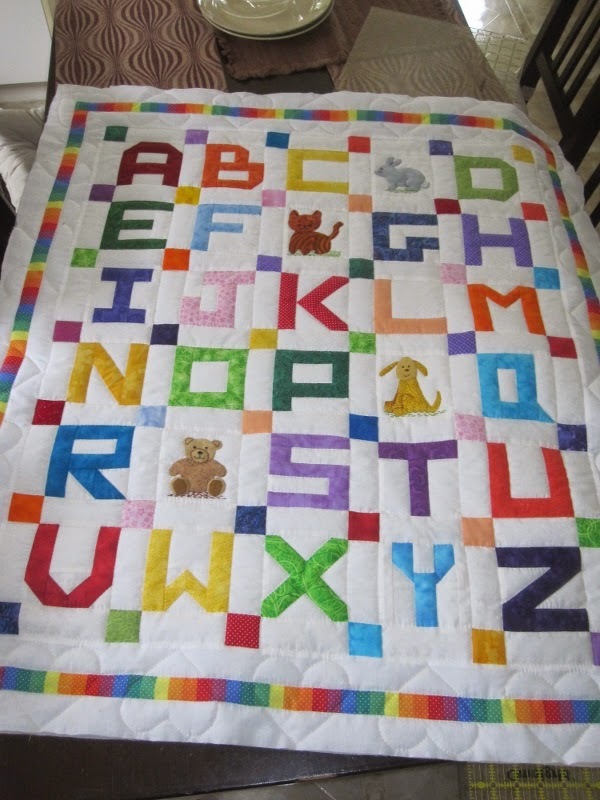 The baby quilt is so pretty and bright! Oh Dolores it's brilliant - the animals are adorable!!! I love the hearts in the border, so pretty!!! 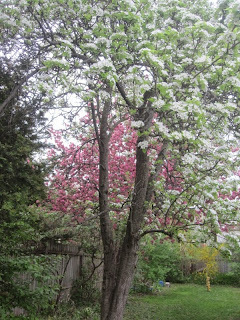 Your yard is looking just lovely - I love spring when all the flowering trees are in bloom! 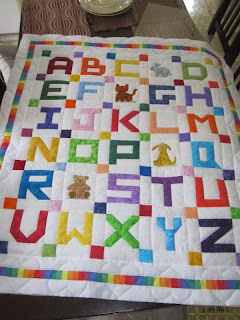 What a very pretty baby quilt! 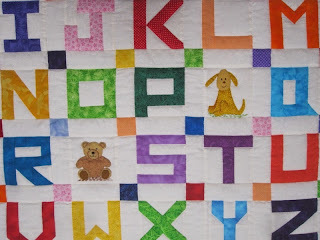 Love the little animals there and some great quilting. 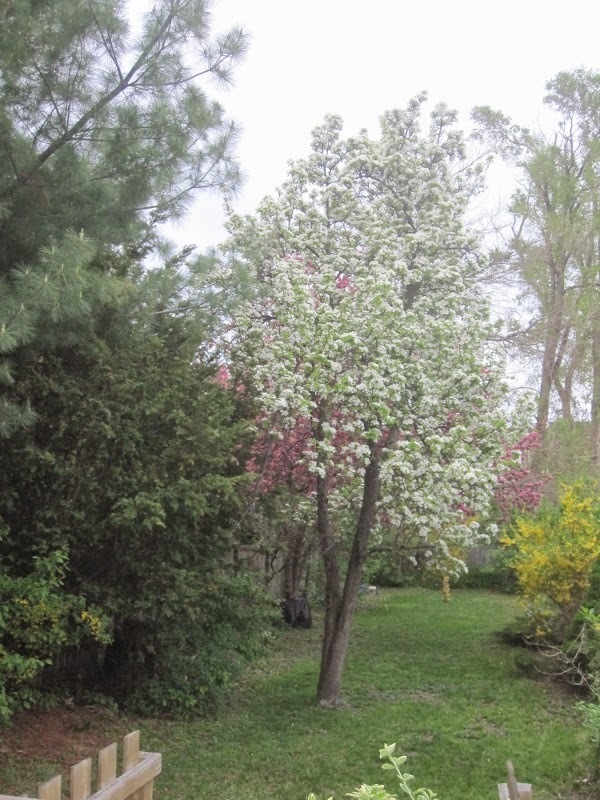 Blossoms are always such a good sign of longer days and warmer weather to come. Happy weekend! I LOVE your baby quilt. 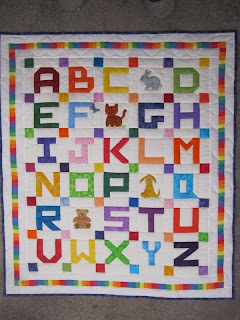 The colours are so bright and cheerful and the addition of applique is perfect , great job ! 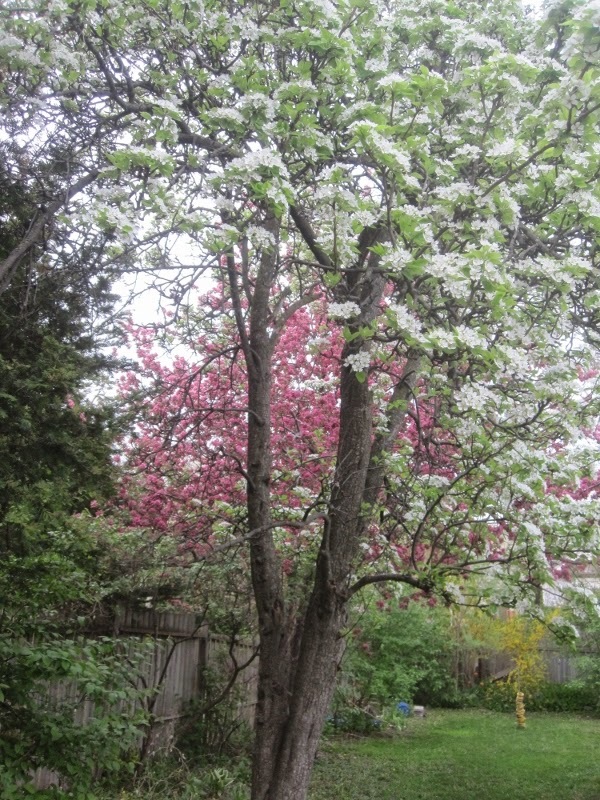 I meant to comment on your yard , just beautiful with all the blossoms ! Such a sweet baby quilt - now the baby can arrive and be wrapped in grandma's love. Exciting times! 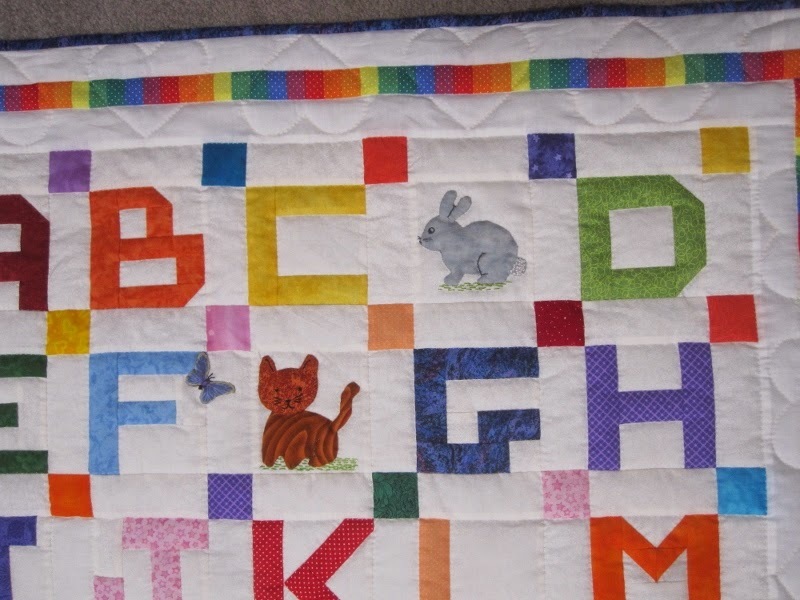 Dolores, the baby quilt is wonderful, and the hand quilting finishes it off beautifully. Your daughter must be thrilled. Love it, so bright and happy, the rabbit is rather cute. I adore that rainbow border and the hearts. What a lovely touch!